Take a modern TTL flash, from any brand, and look at its back. You’re almost sure to see buttons, dials and switches covering the whole surface below a monochrome LCD screen. With varying degrees of success, these controls are designed to allow quick settings changes. German manufacturer Metz has mostly followed this approach but has still made more use of menus than most of the competition, changing the function of the buttons as needed. With the release, in 2012, of the 52 AF-1, Metz went with a radically different approach, removing almost every button and using instead a large touchscreen LCD to interact with the flash. The flash is otherwise very well specified: high-level craftsmanship, a guide number of 52m, a fully tilting and swiveling head with zoom, AF-assist beam, a metal shoe and even a USB port for future upgrades. The 52 AF-1 also packs a few uncommon features that help setting it (and other Metz flashes) apart from the competition. The use of a touchscreen completely changes the way one interacts with the flash. Some competitors, for instance Pentax, rely heavily on rotating dials, which can appear faster for quick adjustment, but also hide functions that can only be accessed when holding down buttons, and sometimes use cryptic terms to identify functions. Is the touchscreen a better tool to handle a flash? 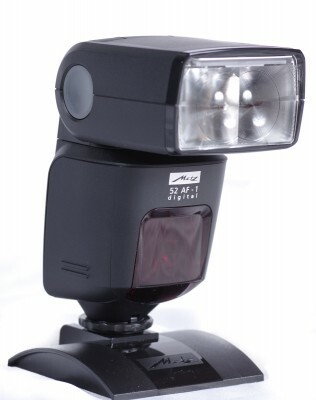 This review will begin with a physical description of the Metz 52 AF-1 flash. Since the touchscreen interface is the most unique and differentiating feature of the flash, a lot of time will be spent describing how to access various menu functions and change parameters. A performance evaluation will also be presented. 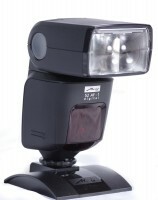 Ready to get your Metz 52 AF-1 Flash? Click below to place an order or check current pricing.